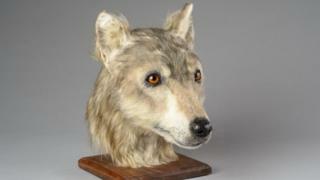 The dog was reconstructed using 3D printing, silicone and fur. This is what scientists think the face of a dog who lived around 4,000 years ago would have looked. They think it would have been about the size of a Collie dog, but with grey wolf-like features. They used special techniques like 3D printing and imaging to help them re-create how the dog might have looked. 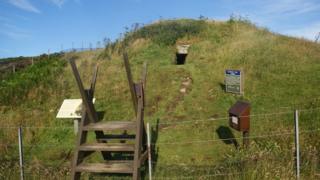 Researchers discovered the ancient dog skull, along with 23 others in a tomb in, Cuween Hill Chambered Cairn, Orkney, in the Northern Isles of Scotland. The skull was discovered in a chamber tomb at Cuween Hill. They think that the dogs were very important to the people who lived there around 4,000 years ago. Steve Farrar, the interpretation manager at Historic Environment Scotland (HES) said: "Just as they are treasured pets today, dogs clearly had an important place in Neolithic Orkney, as they were kept and trained as pets and guards and perhaps used by farmers to help tend sheep." This is the first time scientists have used this type of technology to reconstruct an animal from the Neolithic period (the later end of the Stone Age).